Winger mega hits may have been the sound track to your high school years, but they’re still belting out fresh riffs after 25 years! Anticipation was high before Winger hit the stage Saturday night at Tailgaters. The crowd was at capacity and little did they know they were about to experience a very rare Winger performance. 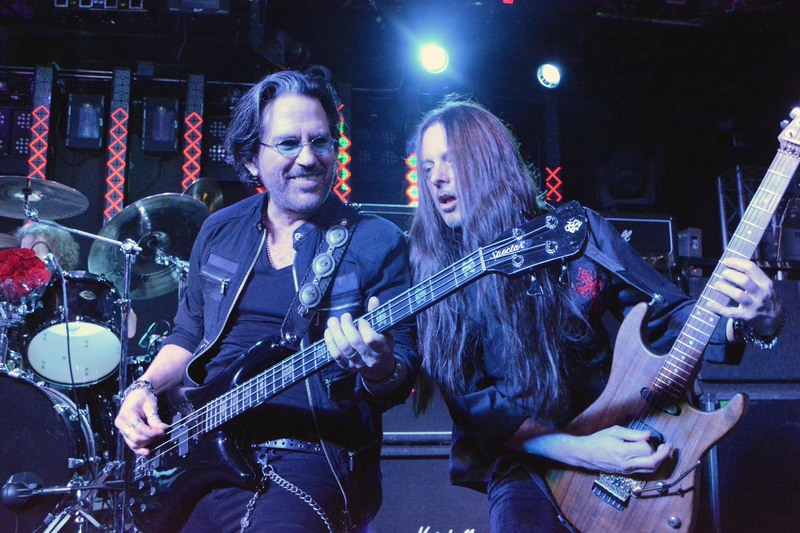 Announced shortly before the show, original band member Paul Taylor (keys, guitar) joined Kip Winger (vocals), John Roth (guitar) and Rod Morgenstein (drums) for this epic night. As one of the last shows of the year, it geared up to be one of the bands most diverse set lists played in 2014. Recently back from Japan, touring off their new release, Better Days Comin’, Winger started the show with the first title off this project, “Midnight Driver of a Love Machine”. Only twenty seconds into the show, Reb broke a string, but within another twenty seconds he was back, hot on the strings, proving he wouldn’t miss a lick! As you could imagine, the hits “Easy Come, Easy Go” and “Hungry” had everyone on their feet and singing along. Backing up Kip on vocals, Reb, John and Paul certainly pulled their own weight singing to “Pull Me Under” and “Down Incognito”. Then, a curve ball was thrown and fans eyes were big, as songs not in the bands original set list were set loose. To everyone’s surprise “Under One Condition”, “Rainbow in the Rose”, and “In the Day We’ll Never See” were bonuses no one expected. Joking around, Kip said of “In the Day We’ll Never See”, “You’ll never hear that song played again”! They didn’t leave out those crunchin’ rock tunes either, such as “Deal With the Devil”, “Stone Cold Killer”, and the heart pounding new tune “Rat Race”. Mega ballads “Miles Away” and “Headed for a Heartbreak” were extra special as Kip was able to focus on his strong vocal performance while Paul took care of the keys. Paul gave the band the extra talent they needed to successfully pull off these songs and more. Next, Winger dealt out the progressive rock song, “Tin Soldier”, from the new album. With only having played this song a few times live, the band delivered it with excellence! The audience was transported back in time when super hit “Can’t Get Enuff” blasted. The crowd got the loudest when Winger burst out with mega song “Seventeen”. Winger is not known for doing an encore, but lucky for this crowd they bounded back to surprise them with “Witness”, which was recently played in Japan but was not a regular for the states. According to Reb’s guitar faces he reached his Zen shredding at the ending of this song. According to Kip, “Witness” was a song fans have requested frequently. The last Winger song played, “Madalaine” was also a loud crowd-pleaser! The crowd must have felt special as they were treated to a 2 hour long set! They ended the night covering Van Halen’s “Ain’t Talkin’ Bout Love” to which they invited John Roth’s nephew up to join the guitar players and another lucky guy on bass. Kip encouraged the crowd to support local musicians and keep places like Tailgaters open for live music to live on. Winger showed their appreciation for their fans with high fives and telling the crowd they were the best! Overall, the fans seemed to leave feeling not only satisfied, but spoiled!